Much as I love the theatre, I could probably count the number of times a play has made me laugh until I cried on one hand. In fact, I could probably count it on one finger. Until last Sunday, that is. 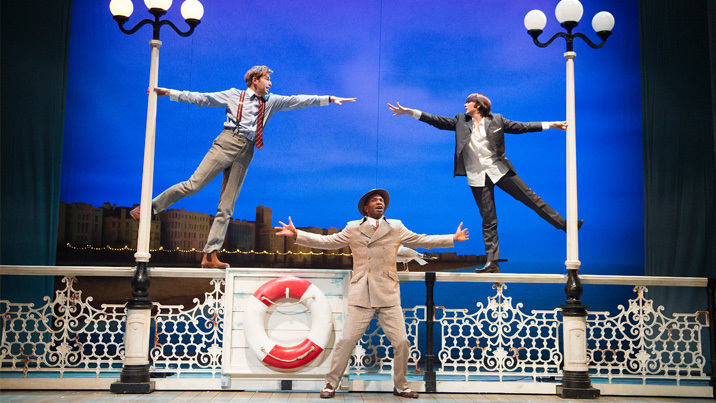 The National Theatre of Great Britain’s award-winning production of One Man, Two Guvnors rolled into the HKAPA as part of 2013’s Hong Kong Arts Festival – and it is without doubt the most sublimely deliriously happy three hours I have spent in a theatre in my entire life. I laughed until I wept… and then I laughed even more. But first, the history bit. 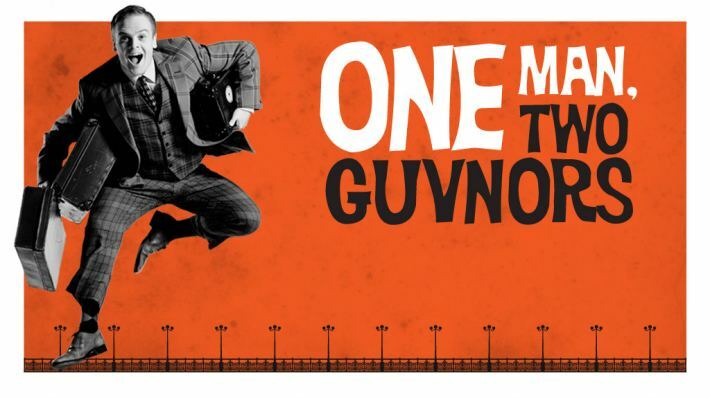 One Man, Two Guvnors is a modern-day adaptation of Goldoni’s 16th century Commedia dell’Arte play The Servant Of Two Masters (don’t worry, I didn’t know anything about Commedia dell’Arte either.) Directed by theatre powerhouse Nicholas Hytner, it became the smash hit of the last few years, transferring to the West End and Broadway, winning a raft of awards, critical acclaim and completely reversing the fortunes of its star, James Corden, in the eyes of a sceptical British public. Having resigned myself to the fact I’d never actually get to see it yet continuing to taunt myself by reading one rave review after another, I was absolutely thrilled that the Arts Festival managed to score the major coup of bringing it over to Hong Kong – with Owain Arthur (above), Corden’s understudy who took over the part to great praise after the original cast transferred to Broadway, reprising the main role. In theatre terms, this is pretty much as good as it gets for the HK arts scene. The plot is pure farce – a riot of mistaken identities, comedic misunderstandings, ridiculous situations and lots of falling over. 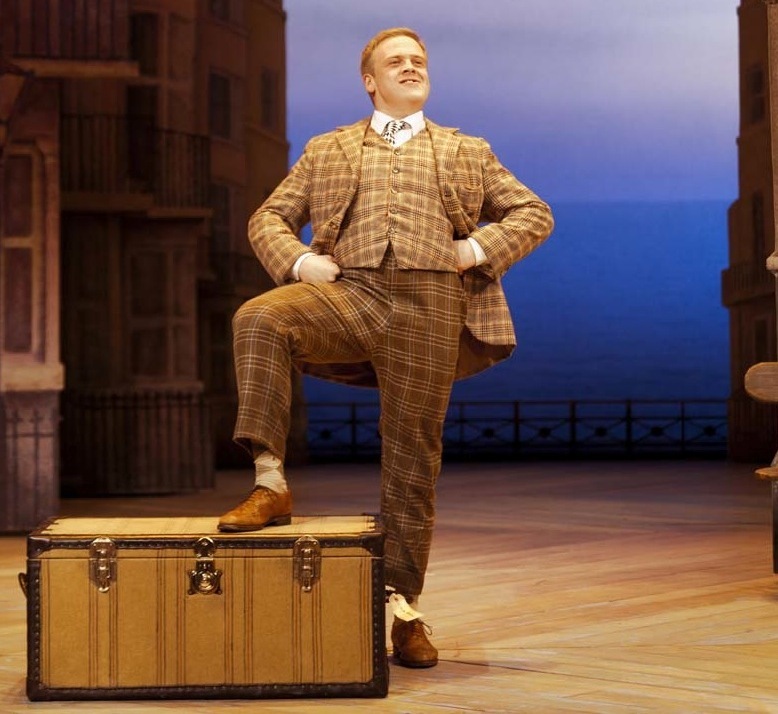 Francis Henshall (Arthur) is the titular one man, his two guvnors local gangster Roscoe Crabbe (Rosie Wyatt) and public schoolboy twit Stanley Stubbers (Edward Bennett). Roscoe wants to collect the fee promised to him for going through a marriage of convenience to ditsy Pauline Clench (Kellie Shirley), yet she’s now in love with someone else. Oh, and Crabbe is actually Roscoe’s twin sister Rachel in disguise, after Roscoe was murdered by her boyfriend… said boyfriend being none other than Stanley Stubbers. Lost track yet?! As soon as I entered the theatre, I knew we were in for a great night. 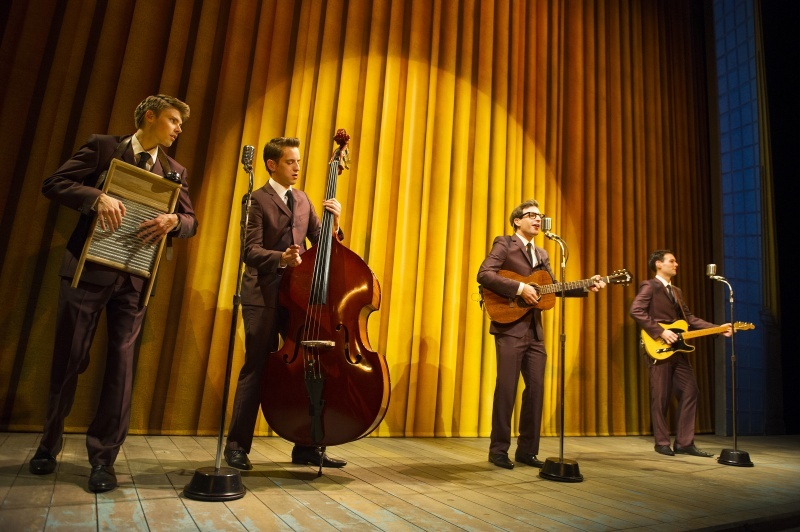 After all, how many plays bother to entertain their audience for fifteen minutes prior to curtain with a 50s style skiffle band, The Kraze (below), where one member plays the washboard (and the lead singer looks like a hot Simon Bird from The Inbetweeners)?! In fact, the rollicking tunes set you up for the evening, which proudly wears its influences on its sleeve – music hall crossed with panto crossed with Carry On crossed with Restoration comedy crossed with melodrama crossed with vaudeville crossed with whatever else tickles your funny bone – and yet it manages to be not quite like anything else you’ve ever seen. The star of the show is, without doubt, Owain Arthur. As soon as he makes his first entrance, you can almost feel the stage lighten. With a roly-poly physique made for physical comedy, expressive elastic features, a lilting Welsh accent and an utterly infectious laugh, he makes it all look so very easy. The best moments come from his absolutely hilarious bouts of audience interaction – these crackle with a brilliant electric sense of unpredictability, and Arthur ensures that whatever the audience throws at him, the results are side-achingly funny. Commedia dell’Arte, it turns out, thrives on improvisation – back in the 16th century, actors would get paid extra if they received a round of applause on their exit line; later, Corden et al would compete against one another to get the most laughs each night. As both cast and audience in Hong Kong start to warm up, you can see them egging each other on, cracking each other up throughout (I loved watching the band, who are on-stage throughout, giggling away with the rest of us) until the whole thing snowballs into an unstoppable avalanche of laughs. Complete with musical interludes from the cast, frequent breaking of the fourth wall and regular asides to the audience, this is a play that thrives on its theatricality, unpredictability and spontaneous crackling energy. That sensation of being in an audience swept away on the crest of a wave is unbeatable. You simply can’t get this from movies or television… and that’s what made me love it even more. 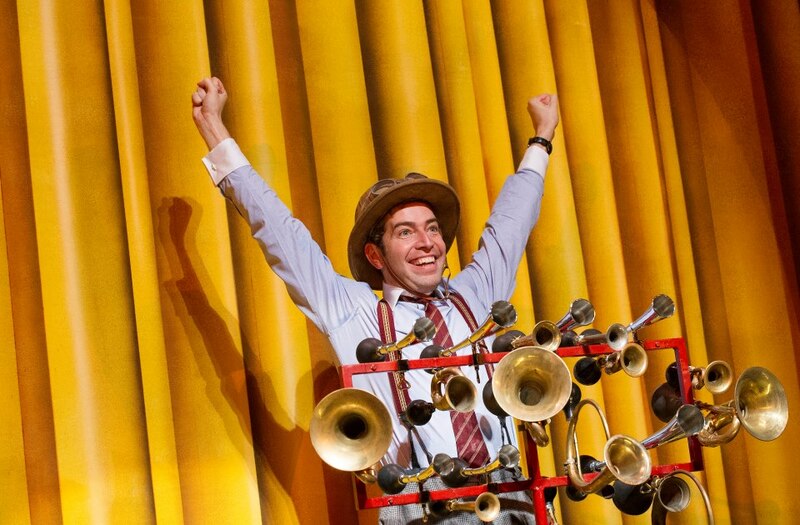 I also particularly enjoyed Kellie Shirley’s gloriously dumb blonde Pauline Clench, and her ham-tastic actor beau Leon Williams as Harry Dangle (at one point, Williams plays his torso as an instrument – it has to be seen to be believed!). Both throw in performances so big that you could probably see them back in London, yet they still manage to be uproariously funny without feeling forced. Meanwhile, Edward Bennett (above) gets many of the best lines (‘Soggy biscuit!’) as posh boy Stanley (with so many reviews concentrating on physical comedy, I was surprised by quite how much sharp wordplay and quick one-liners Richard Bean’s script packed in), so it’s a shame many get swallowed amongst the fast pace, audience laughter and wobbly acoustics of the HKAPA. With a bright 1960s Brighton set, colourful period costumes (note Francis Henshall’s checked suit, a neat call-back to the harlequin role in Commedia dell’Arte) and a full song-and-dance number at the end, One Man, Two Guvnors is not a show that does anything by halves. Even when you think it couldn’t take a joke any further, it still goes that one breath more to leave you wheezing for mercy. The play builds up a manic momentum, reaching a crescendo with the final act of its first half (a restaurant scene that’s a master-class in pure farce) that the short-feeling second half just can’t live up to. And so, 900 words later and I still feel I haven’t done justice to quite how hilarious this show is… and it really is hilarious. It’s as simple as that. The only type of pain I enjoy is the kind where you start to physically hurt from laughing so hard – and One Man, Two Guvnors delivers that sensation in spades. It’s a potent reminder of the power of live theatre, and a beautiful bawdy love letter to quite how wonderful comedy can be. 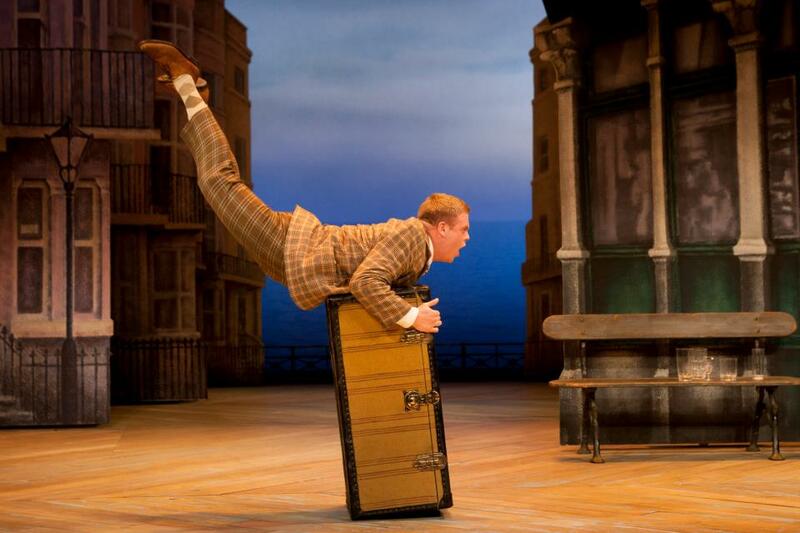 One Man, Two Guvnors by The National Theatre of Great Britain, 15-23 February 2013 (part of the 41st Hong Kong Arts Festival). Tickets cost $200-580. This entry was posted in Culture, Hong Kong, Theatre and tagged Commedia dell’Arte, Edward Bennett, Hong Kong Arts Festival, Kellie Shirley, Leon Williams, National Theatre of Great Britain, Nicholas Hytner, One Man Two Guvnors, One Man Two Guvnors HK, One Man Two Guvnors Hong Kong, One Man Two Guvnors international tour, One Man Two Guvnors review, One Man Two Guvnors touring production, Owain Arthur, photos, review, The Kraze. Bookmark the permalink. I saw this in London when Arthur was in the lead role and have to say its been one of my favourite pieces of theatre I’ve ever seen. 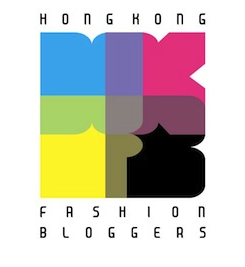 A great review and I’m very glad they took it over to HK for you to enjoy! Thanks Catherine! I wish I had been able to see it when Ollie Chris and Jemima Rooper were in it with Corden (two of my fave tv actors ever!) but am SO happy it came to HK… and Arthur and co. definitely did not disappoint. Such a great night of theatre! Have you see The 39 Steps at the theatre? That’s really good as well (though not quite as hilarious). I’ve not seen the 39 Steps though I remember walking past the theatre where it was on and thinking “I should probably find out if that’s any good”. The other thing I saw quite recently and loved (which has sadly now ended) was A Chorus Of Disapproval starring Rob Brydon (who was hilarious) and Nigel Harman and Ashley Jensen. I’m not the most regular theatre goer but I really enjoyed that.